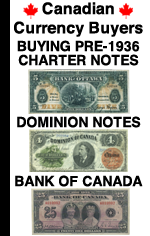 Our site has the premier guide about old five dollar bills on the internet. This guide is dedicated to The United States five dollar bill. We have values and descriptions of dozens of different bills. Whether you have a five dollar national bank note, gold certificate, silver certificate, treasury note, legal tender, or just a federal reserve note, we are happy to help and provide information about values and prices. The old five dollar bills shown below represent the major design types used for the denomination by The United States between 1861 and 1928. When selecting your bill, focus less on the year and more on the design. Some five dollar bills could have several different years on them. However, the design style will always be the same. 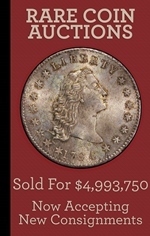 Click on a $5 bill below to learn more about the value and significance in today’s market. Most old five dollar bills were printed after 1928. They are the same size as $5 bills are today. We are focused on older money. We are specifically interested in old bills printed between 1861 and 1928. The older bills are about 35% bigger than current circulating money. We would strongly suggest that you browse all the pages to learn more about the value of your old five dollar bill. We are happy to answer any and all questions. Five dollar bills are a fun denomination to collect. There were eight different men featured on antique five dollar bills. We have a guide to who is on the $5 bill. There are also a lot of iconic and are five dollar bills. The first ones that come to mind are the 1899 chief, 1896 educational, and the extremely popular 1886 Morgan coin back note. Of course the wood chopper is a popular note and 1923 portholes have been a favorite for decades. Five dollar bills were issued as national bank notes. Very early national banks that opened between 1862 and closed before 1880 often only issued five dollar bills. Series of 1882 brown back were also issued. There are dozens of different layouts on 1882 $5 brown backs. Many collectors specialize in that area. 1902 five dollar red seals can be very rare from certain states. 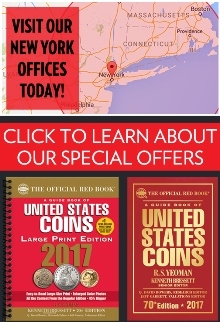 A lot of banks only printed ten and twenty dollar red seals. What is the most we have paid for a $5 bill? In the summer of 2012 we paid $130,000 for a very rare bank note. It was the first five dollar bill printed by the Territory of Arizona. Other highlights are a serial #1 brown back from Tennessee that we paid $50,000 for. We also handled a unique 1902 red seal from Oklahoma that was worth $84,500. What is our favorite old five dollar bill? That is like picking a favorite child. However, I think we would have to go with the 1899 $5 silver certificate. It isn’t extremely rare but people always enjoy looking at them. I also like low serial number 1914 federal reserve notes (blue or red seals). Why are you qualified to value five dollar bills? There is a long answer there, but I will try to make it short. We have handled every type of five dollar bill issued by The United States. We can accurately grade based just on scanned images. Furthermore, we see thousands of notes a year. Our experience is why we are qualified. You can see our free services on our five dollar bill appraisal page. What is the most common large size five dollar bill? 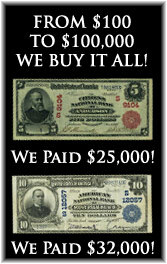 That shameful designation is earned by the 1914 $5 blue seal federal reserve note. Most notes from that series are only worth about $40. As usual, there are exceptions, but 99% are worth less than $100. Were any old five dollar bills counterfeited? Yes, but they are easy to spot. The only fake $5 bills you are likely to see will be on obsolete notes, confederate notes, and some very early national bank notes. Send us pictures of what you have and we can quickly advise if it is authentic or not. The links below will take you to show what five dollar bills have looked like across the decades. We have included a year for each national bank note because there is always confusion about the charter date compared to the series date.